Darrell Wayne decided in junior high school back in the ‘60s that he wanted to pursue a career in radio. He followed that passion to a high school job at a local radio station all the way to becoming Insane Darrell Wayne on the Los Angeles station KROQ in the 1970s. These days he owns a classic rock radio station in Lake Tahoe, California. We recently had the honor of speaking with Darrell about following his passion, giving classic rock artists a contemporary voice at KTHO and trying to save the traditional radio station. Darrell fondly remembered his days at KROQ which he called “every bit as crazy as it sounded or it seemed on the air." And while he was at the forefront of creating a legendary station, his fondest memories were the times he was able to meet childhood heroes and pop superstars. But Darrell fears with the onset of iTunes and Pandora that the art of the radio DJ is a lost one that should be preserved. He stated, “The radio disk jockey is really what ties the story together. If you just play music, you’re a jukebox. You’re a random selection. You’re an iPod on shuffle. We’re more than that. We put together radio programs. We play records that make sense together. Every song is hand selected." He continued, "We tell stories around the music. We say what was going on at that the time… We tell what was happening before the concert and after the concert. We tell the stories about the history of the music and the history of the artists. Music is the soundtrack of our lives. The music that we’re most endeared to usually is the music that we listened to in high school and in college. When we hear those songs again it evokes the memories of what happened at that time." Darrell recently encountered some college students who love classic rock and asked what would make hearing the songs more enjoyable to them. He recalled that they said, 'They wanted to hear the stories. They wanted to hear what was happening at the time. They wanted to hear our memories of when this music was created and came out." He said KTHO is taking a new approach to the classic rock formula. They are giving a voice to the older artists who still produce new material but do not get played on the classic rock stations anymore. They play the new music by artists like Ringo Starr, Neil Young, Elton John and Bruce Springsteen. He noted, “We’re not just playing the same tired classic rock songs over and over and over." 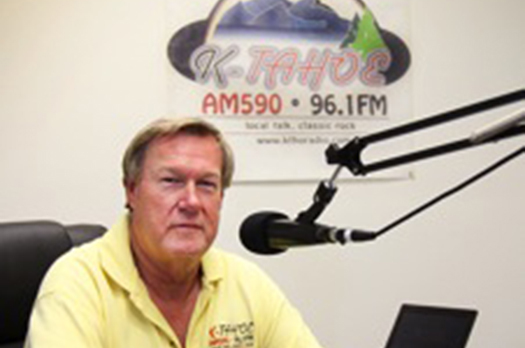 In the Tahoe area you can tune into KTHO at 96.1 FM or 590 AM or anyone, anywhere, can stream the classic rock revolution online KTHOradio.com.